A few weeks ago, my DSL modem died. After calling the phone company, I was promised a new one. When a week drifted by and no new modem in sight, I decided to call the cable company. The new cable modem arrived, I hooked it up, and contacted the cable company to activate my service. I did a little jig first, but it didn’t help. I still had no internet. Two weeks and several phone calls later, it turns out that someone had cut the cable and stolen the box that was supposed to be attached to my home. Why the first guy who came out to “activate” the service didn’t catch this, I’ll never know. All that matters is that I finally have internet again. It’s like having a limb reattached. While I don’t have an actual frame of reference, it’s like I imagine it would be: glad to have it back, but hazy because you aren’t quite sure what to do with it yet. But while I was out of touch with the world, I’ve discovered much since I had to find other uses for my time. I don’t watch much television (think less than 30 minutes a day) and I can only read for so many hours before losing my mind, so my options were limited. In fact, most of the internet-less time was spent uncluttering my home. And what a behemoth task that was (and still is because, truth be told, I’m not finished). One of the primary areas of contention? Books. Lots and lots and lots of books. I stopped counting at 300. I got rid of two boxes of them and I still have too many. I’m a stationary freak with a journal fetish. So if the journal is pretty or the paper seems ideal for writing a particular story or novel, it will end up in my collection. Not to mention the pens and pencils. 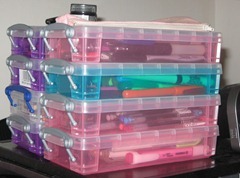 Twelve pencil boxes full. TWELVE. Probably more that I don’t even know about. I like to draw and all, but what human being needs that many pens, pencils, highlighters, and other writing tools? I’m so ashamed. But, I’m hoping to turn over a new leaf…a brutally honest and practical leaf. So, as I continue going through my books and stationary and writing implements, I’ve decided to start giving away that which I know I won’t use in this lifetime. 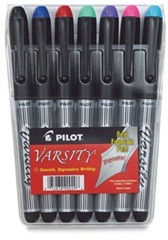 First up will probably be my Pilot Varsity Disposable Fountain Pens. I’ve tried to like them, but don’t. The line they produce is too thick for my liking and the nibs aren’t flexible enough (I like line variation). However, they’re good basic fountain pens that I’m sure would make someone else happy. In the interest of full disclosure, these pens are used. All of them, except red, are 90%+ full. The red, however, is almost depleted. Not sure how because I haven’t actually used it, but it is what it is. They’re free to the first person willing to pay the $5 shipping. Just send me an email. I figure if this works out well enough, I’ll start giving away more free stuff on the blog.